A portrait of Juliana, a Great Dane, who was awarded the Blue Cross twice in London. From September 7 1940 to May 1941, the United Kingdom was experiencing one of it's darkest moments in history, the German Blitz, eventually killing up to 43,000 British civilians with tens of thousands more wounded. But despite all the rationing, blackouts, Axis aircraft and the war itself, the British people stayed strong and with their spirit came many heroic accounts of air raid wardens, fire fighters, nurses and doctors, volunteers and the British airmen. 72 years after the Blitz, a new story came to light. 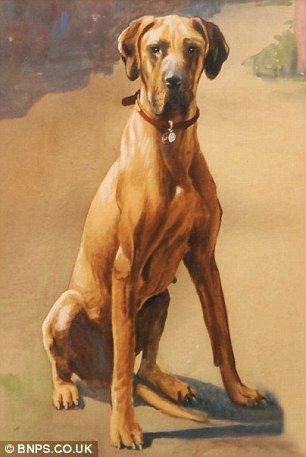 In September 2013, two medals and a portrait of a Great Dane were found during a house clearance in Bristol, England. It was discovered that the Great Dane was named Juliana, who was awarded two Blue Cross medals. She earned her first medal for her actions in April 1941, in London. It was another dark night, London has been bombed every night by the Luftwaffe for quite some time now, but this night witnessed something unusual. As the Luftwaffe dropped incendiary bombs, which were meant to start fires, one bomb went through the roof of a house, a house that Juliana and her owners lived in. It was reported that once the bomb hit the floor and started igniting, Juliana ran to the bomb, stood over it and urinated on it, extinguishing the fire. For this great act of heroic urination, she was award the Blue Cross. It wasn't until the finding of the second medal behind the portrait that showed another story behind this fire fighting dog. It occurred later in the war, in November 1944, an accidental fire has started in her owner's shoe shop. She managed to warn her owner's family of the fire and prevented a tragedy. She was given a second Blue Cross for this. Sadly, Juliana died of poisoning in 1946, a year after the war ended, after someone placed a toxic substance in her owner's mailbox.